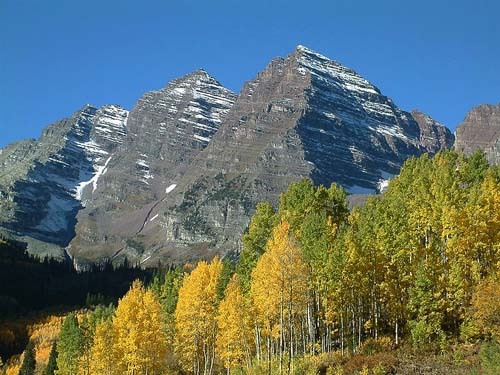 Did you know that quaking aspens are not separate trees, but are instead whole colonies of trees? They are all connected underground through the same root system. The largest colony near Fishlake, Utah, may be 80,000 years old and covers more than 100 acres. These aspens are lovely trees, fluttering in the breeze, a beautiful gold color in the fall. Through a process called “phytoremediation,” these and other plants can detoxify their surroundings by internal processes which transform harmful chemicals into less harmful ones. Of course, it’s best if we don’t put harmful toxics into the air, water, and soil in the first place, but a lot of damage has already been done, and natural ways to help clean it up are a good idea. One of the most remarkable aspects of Laura J. Merrill’s Secret Voices from the Forest is that it gives trees a voice, relating to them as conscious beings. The book is organized according to eco-systems. Volume One: the West, the first of four volumes (the three others are yet to be published) highlights eleven species of trees, and a twelfth category, Old Growth Forests. Each tree is described in detail, has a section in which the tree “speaks” to us, and then the birds, animals, and other plants that surround the tree also appear. As well as enlightening, little-known scientific facts, and the inspirational words “spoken” by the trees themselves, also included are poems by Brian R. Mitchell. Since Christmas is approaching, here is another fact that may have eluded you. 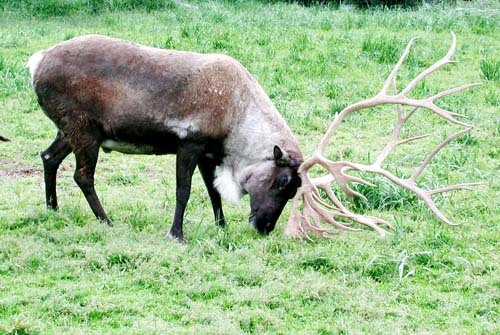 In caribou, the American name for reindeer, both the males and the females have antlers. And, as we all know, Santa’s reindeer do have antlers. However, male reindeer lose their antlers in the winter, so Dasher and his friends, though they all have male names, must really be female reindeer, who still have their antlers in the winter. So, when you hear their hooves prancing across your roof on Christmas Eve, remind yourself that they are female reindeer, hard at work helping Santa deliver the gifts. 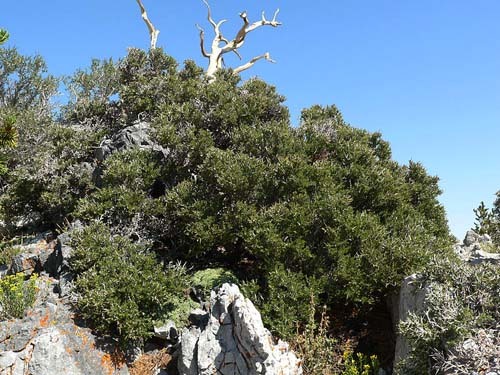 Along the Pacific Coast Ranges and the Great Basin can be found the Mountain Mahogany, and among this tree’s companions are kit foxes, very small cat-like foxes that can be observed sometimes at twilight darting across roads. Another mountain mahogany companion is the Golden Yarrow that ancient people used to stop bleeding and that also attracts butterflies. At the archeological site, Shanidar IV, in Iraq, dating from around 60,000 BC, yarrow was one of many herbs found there, as part of a Neanderthal flower burial. So if you were wondering what Neanderthals were doing around 60,000 BC, they had already learned to use medicinal herbs. The Mountain Mahogany is part of the Rose family, which of course isn’t just roses, but also includes three thousand known species of herbs, shrubs, and trees, including a great many common fruits, like apples, pears, almonds, peaches, apricots, plums, cherries, strawberries, blackberries, and raspberries, as well as the flowers we know as roses. Who would have guessed? This beautifully designed and illustrated book is filled with fascinating lore about trees and the eco-systems that surround them, and how the plant and animal species interrelate with each other. From time immemorial, in all places and at all times, trees have formed a bridge linking us, as humans, to the sacred. This has never been more true than in the present time, when even as trees and forests are under threat, and so many have already disappeared, this does not make the existence of trees less important, but more significant than ever. Trees are key to all life, and if we wish to enable all plants and animals, and all of nature, to thrive on the earth, as well as ourselves, trees are a good place to start. To order Secret Voices from the Forest, Volume One, the West from Amazon, click here. Back in 2005, when Mkombozi (she received her name later and is called Muk for short) heard a human baby crying in a garbage dump, she recognized the sound and knew right away that it was a baby. The mom of the family that took care of Muk had had several babies, and that’s what they sounded like. Muk sniffed around and found the baby wrapped in some old clothes. She picked up the ties of the bundle in her mouth, and headed back, with the baby, across the busy Ngong Road, in Nairobi, Kenya. Weaving her way through the fast-moving traffic, miraculously, she arrived at the other side. Later a neighbor recalled watching her carrying the bundle and wondering what she could possibly have found. Muk went back to the house where her family lived, and set the bundle down gently at the feet of the children playing in front of the house. The children called their mom, who picked up the newborn, and called the police. The area near the Ngong Racecourse is in a slum, and Muk’s family was very poor. 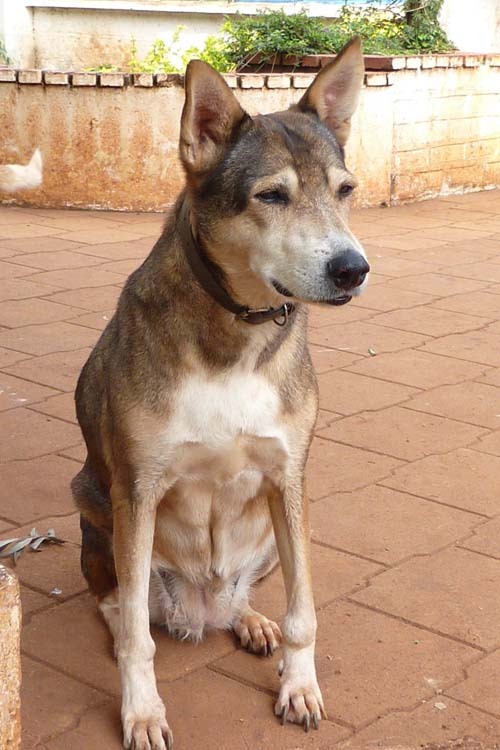 Before Muk was born, her street dog mom had made her way into the family’s compound to have her puppies. Sadly, the other puppies died, but Muk was very tough, very smart, and managed to survive. As she was growing up, the family gave her what food they could, and she learned to scrounge for more, making her way through the streets to the garbage dump and back again. Like many community dogs, although she was out on the streets, she also had a home, a place where she was welcome and where people cared about her. The rescued newborn was rushed to the Intensive Care Unit at Kenyatta Hospital where she was to spend the next three weeks. During this time the remarkable story of the dog who rescued the newborn baby from the trash heap was picked up by the newspapers. It went viral, and was published all over the world. Jean Gilchrist, Director of Animal Welfare of the Kenya Society for the Protection and Care of Animals (KSPCA), read the amazing rescue story in a newspaper. Because KSPCA runs a very active spay/neuter program, which is the most effective way to help community dogs, she looked up Muk’s family, to see about spaying her so that there wouldn’t be any unwanted puppies. 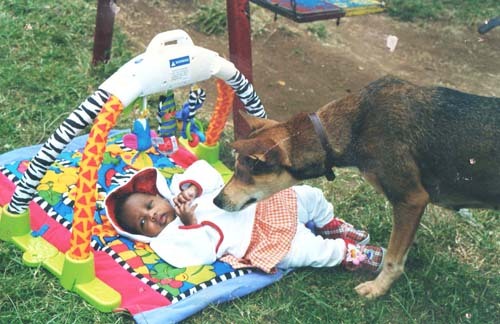 As she got to know the family, Jean discovered that Muk was especially fond of the children, though, like most street dogs, she was a little shy around adults. In fact, Muk had recently had two puppies. When Jean offered to get Muk spayed, and to bring her, with her two puppies, to the KSPCA shelter, the mom who’d been struggling to care for Muk as well as her children was greatly relieved. Often, there had been no food left over from the family meals, and she was glad that Muk would now get enough food, and not be in danger every day crossing the busy street. Sadly, the puppies, who were sick and malnourished, did not survive, but Muk had arrived in a good place and began a new start to her life. She was bathed, de-wormed, vaccinated, and spayed. She received her new name, Mkombosi, which means “savior,” Muk for short, and, within a few months, she began a career that she thoroughly enjoyed, interacting with school children, and helping some, who’d been afraid of animals, to get over their fear. After a few moments of petting Muk, any fear the children may have felt seemed to melt away. At first, there was some thought of adopting her out, but, because by now her story was so well known, everybody wanted her, and that in itself was a problem. She would be safer and more secure at the shelter, where she has both dog and human friends and is much loved. 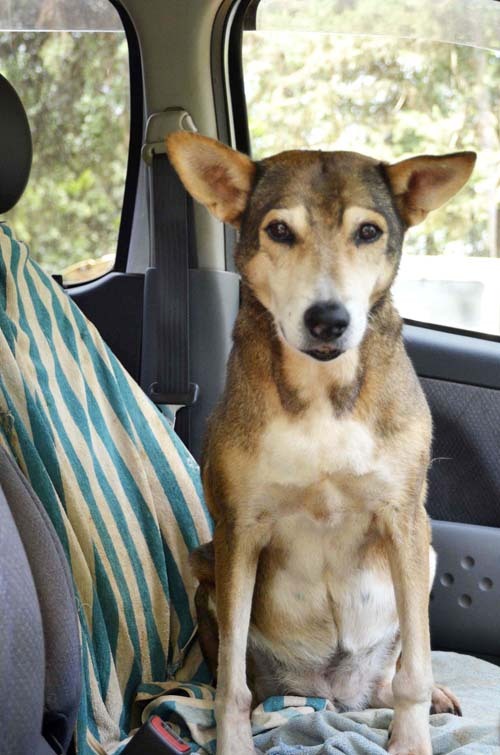 Now around eleven years old, Muk loves going out for a drive in the car with Jean and her other dogs, and has occasionally gone home with them, but she prefers being at the shelter where she can just hang out, relax, and fall asleep with her friends. After three weeks care at the hospital, the tiny baby was strong enough to go to Thomas Bernardo’s house, the local orphanage. Attempts to find the mother who had abandoned her were unsuccessful. The little baby was first called, “Angel,” then “Angela.” In a few months, Jean brought Muk to visit Angela. In the unfamiliar surroundings, Muk was feeling a bit insecure and so did not show much interest in Angela — until the moment when Angela began to cry; this sparked a memory in Muk, who started energetically wagging her tail and wanted to lick the baby’s face. Happily, after a while, Angela was adopted; the orphanage, respecting the privacy of adoptive families does not release their names. Jean Gilchrist hopes that little Angela will be told the story of how her life was saved by a kind, heroic street dog, and that she’ll grow up knowing dogs as loyal, dependable friends. It would be hard to find a more heart-warming story, but it’s only the most well-known story of all the worthwhile work carried out over the years by Jean Gilchrist and the KSPCA team. 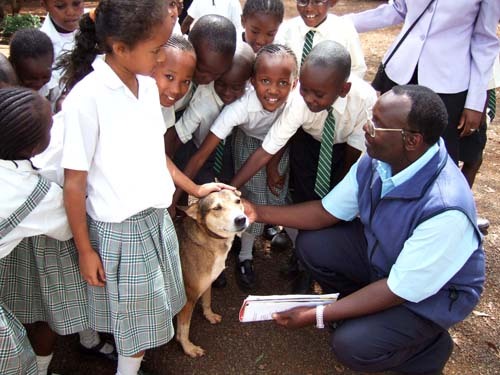 In Nairobi, where animals, as well as people, can sometimes suffer due to poverty, the KSPCA accomplishes such a remarkable amount of good; they have become known as a bright haven for animals there. To learn more about the work of KSPCA, click here. Prashanth Krishna, the CEO of Kindness Kids, made friends with a calf at the beginning of an orientation workshop for teachers attending the launch of the Kindness Kids program in Mysore, Karnataka, on November 7, 2012. Kindness Kids, a project of the C.P. Ramaswamy Aiyar Foundation, sponsored by the Winsome Constance Kindness Trust, Australia, fosters compassion towards animals in school children, giving them an insight into the harm done by factory farming to both animals and the environment, and encouraging a vegetarian diet. First the teachers are given an overview of the program and its aims so that they will be able to teach the students effectively. Last August, in Bangalore, 85 teachers from 20 schools attended a similar workshop, preparing them to guide their students toward greater sensitivity and understanding of animals. 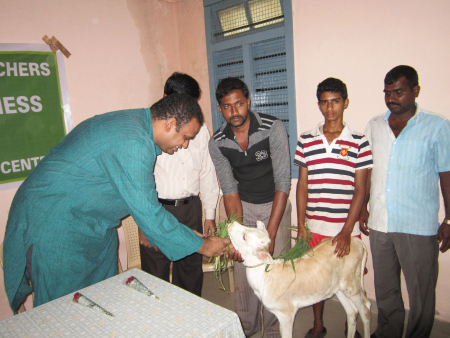 The Kindness Kids program is also well underway in Chennai, Tirupathi, and Hyderabad, reaching thousands of children with the message of kindness to animals. To visit the website of Kindness Kids, click here. As was reported previously, the Visakha Society for Protection and Care of Animals (VSPCA) has experienced severe damage from Cyclone Nilam which struck the East Coast of Andhra Pradesh a few days ago. The main shelter, on the coast of the Bay of Bengal was the worst hit. Thanks to the quick action of the staff, all the animals are safe, and those who needed to be evacuated were moved out of the way in time. The canal that runs behind the shelter rose to a depth of nine feet, and water inside the shelter was knee-deep. The buildings were damaged, as well as the fodder for the cows. 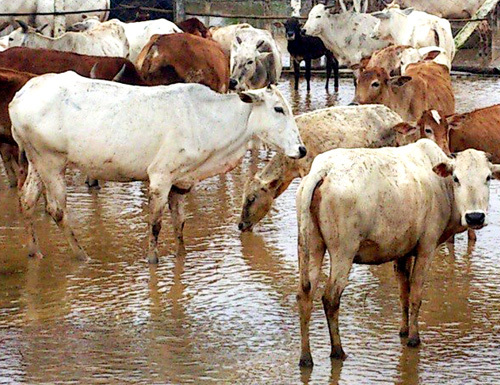 The cows now need extra vet care to ward off flood-caused diseases and damage to their feet caused by walking in the mud. At the second shelter, the Kindness Farm, which is further inland, the flooding was not as bad, though some of the same problems have affected the animals. The only animal missing is Charlie II, a rescued star tortoise. It is believed that he has survived, since he’s a good swimmer, and it is hoped that he’ll be found soon. While searching for him through the water, one of the staff people got bit by a snake and had to be rushed to the hospital. Snake bites are one of the hazards of flooding. He is fine and is recovering. The Kindness Farm, in Andhra Pradesh, run by the Vishaka Society for Protection and Care of Animals, has been flooded by Cyclone Nilam. The main VSPCA shelter, which is on the coast, was hit with a nine foot wall of water, and suffered much greater damage. Because of the emergency, it hasn’t been possible to take photos there. 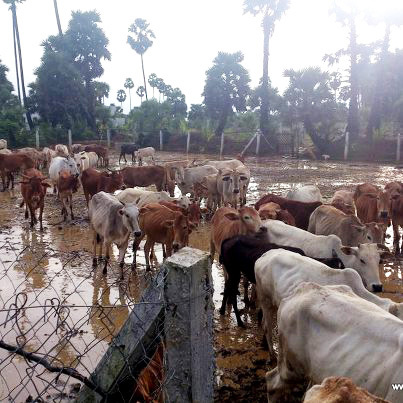 The cows and other animals had been moved to higher ground, but they now require emergency medicine and vet treatment, as well as special feed, because the ground is so wet that there is no place for the animals to rest or to graze. Much repair needs to be done at the shelter to fix cattle sheds, walls, poles, drainage channels, buildings, and gates. Much more feed will be needed for the animals, and more caregivers will have to be hired because of the emergency conditions. Thanks to Eileen Weintraub, Founder of Help Animals India, for information she contributed.